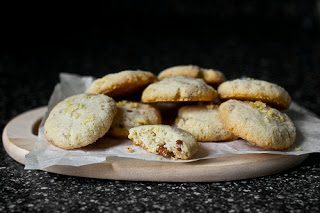 Just love the salty/sweet thing going on with these cookies! Line two baking sheets with parchment paper and set aside. In a large bowl, cream together the butter with 1/2 cup of the sugar until lightly and fluffy. Mix in the vanilla and table salt, if using, until smooth. Add the pecans, 1/2 cup crushed potato chips and flour together and mix until just combined. Place the remaining 1/2 cup sugar in a small bowl. Scoop a tablespoon-sized mound of dough and form it into a small ball with the palms of your hands. Roll the ball in the remaining sugar until coated. Place on prepared baking sheet and using the bottom of a drinking glass to slightly flatten the cookies. Cookies only need to be an inch apart; they only spread a little. Sprinkle with a few flakes of the potato chip salt, if using. Repeat with remaining dough.